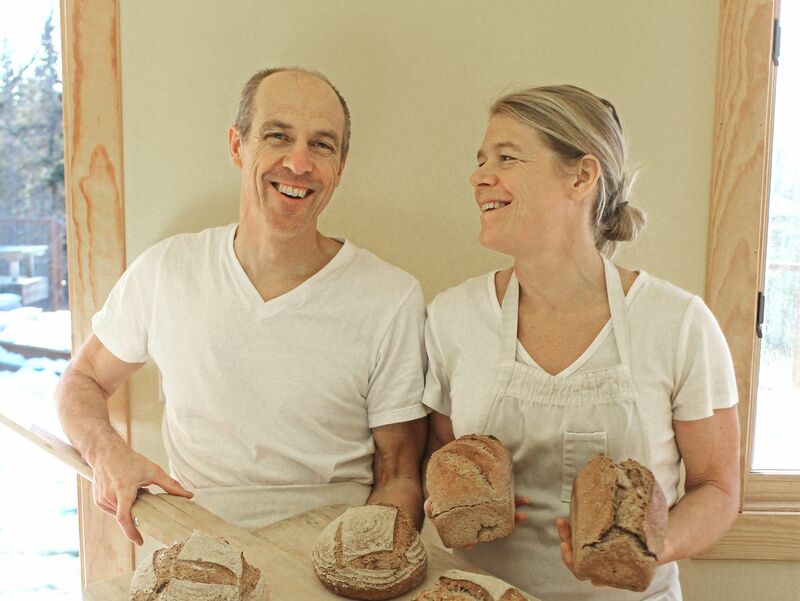 Dan Schwartz and Alison Arians wake up at 4 a.m. to bake tomorrow's bread. On a floured cutting table in their bakery sits a mound of tawny-colored mix, speckled with pumpkin, sunflower and sesame seeds, from which the duo pulls deflated spheres of sourdough. Handful after handful, they roll and shape the orbs and place them into individual baskets on baking trays, a method that will give the loaves a hemispherical shape with a lot of crunchy crust. While the first loaves rise, they'll start prepping another batch. By day's end they'll have five varieties (and several hundred individual loaves) of bread baked. They'll work long into the evening to finish bagging, labeling and packing up their signature sourdough to sell the next morning. Their hearth stove may be able to bake 100 loaves—either traditional pan loaves or rounded hearth loaves—in one go, but what Schwartz and Arians are doing can't be measured with a kitchen timer. The process takes commitments to tradition, craftsmanship, their community and each other. You see, the husband and wife duo that owns Rise and Shine Bakery didn't follow a particularly conventional road to being one of the baking bastions of Anchorage. Schwartz worked as a biochemist, then a furniture maker. Arians received a graduate degree in geography, which she used as a natural resources planner for the Alaska Department of Natural Resources for many years. It wasn't until 2007 that the duo started seriously discussing building and opening their own bakery. "Baking bread made sense to us," Arians said. "We both turned to baking when things got hard in our work lives, we realized. Baking was solace." So that year they turned an addition to the back of their home—which had previously been Schwartz's woodworking studio—into a bakery. No easy task considering nobody else had built a commercial kitchen in their residential area. But, after months of getting up to code and securing permits, Rise and Shine was open for business. "We actually got customers out of the process," Arians said. "The fire safety guy buys from us and so does the health inspector. I think that's a good sign when your health inspector buys from you." While the words "craft" or "artisan" are buzzwords commonly associated with wild and off-the-wall recipes, Rise and Shine focuses on forging diverse breads with wholesome, local ingredients in traditional ways. 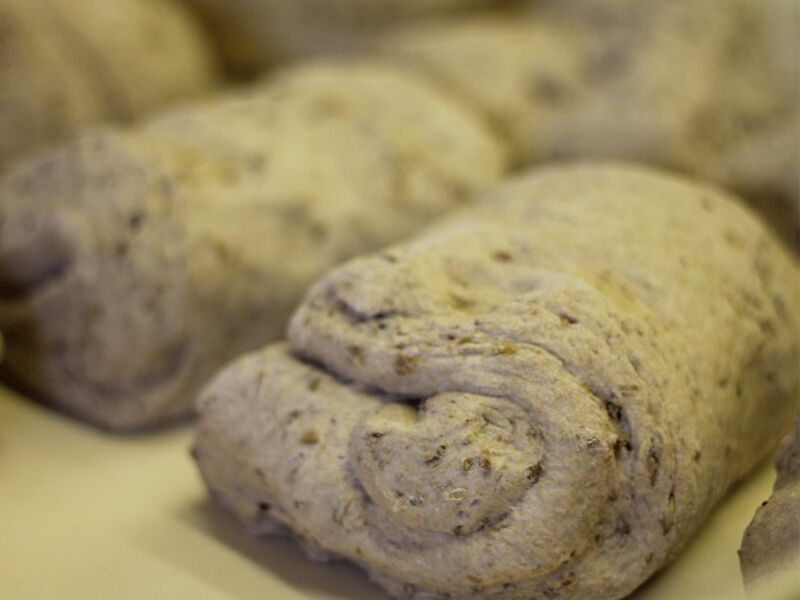 "We'll likely never make something like cognac fig hazelnut bread," Schwartz said. "We're more into bread as a basis of healthy diet and being something you can enjoy every day, so we're very traditional with our approach. We'd rather focus on making a good product than trying too many different things." The loaves they craft are either 60 or 100 percent whole grain sourdough. One features Alaska potatoes as the vital ingredient, another uses spent grain from Midnight Sun Brewery and others use kalamata olives, fresh rosemary or dark chocolate and cherries. All are hand-crafted, from the mixing, to the fermenting, to the shaping. They even mill some of their own grain flour. Their emphasis on tradition means they have to be really careful about keeping their sourdough happy. Sourdough is different from commercial yeast. It's bread which has been made with a starter rather than yeast to create a loaf. The starter is a mix of flour and water, which is fermented and fed with additional flour until it becomes a thick mixture. This will be used as a rising agent in each batch of dough. It is also slow to rise and needs to be carefully "fed" and monitored. "It's like a persnickety pet," Arians said. "If we travel for more than 10 days, we bring our sourdough starter with us. It can die if it digests all the nutrients. We need it to stay healthy because we need it to bake 400 loaves when we get back." Because of the inherently healthier nature of their bread—it's dairy free, has minimal salt and sugar and has lower levels of gluten than what is produced with commercial yeast, a positive in a world where "carb" may be considered a four-letter word—Rise and Shine has risen in popularity. Even so, the duo have kept a small business model. From June to September, they sell at the South Anchorage Farmer's Market every weekend. But during the winter, their customers pre-order online and are able to pick up their loaves once a month. "Somebody once described us as having a lifestyle business," Schwartz said. "We're busy in the summer and slower in the winter, which we needed because we're homeschooling our daughter and take a lot of trips. A normal business plan wouldn't allow us to take that same time off." The couple said they are frequently asked why they don't open a commercial space. Again, it doesn't fit into the model they wanted. "We want to have a continued connection to our customers," Arians said. "We see them week after week. I know which bread certain people are coming for. It's a good community. If they weren't so supportive, we wouldn't be able to do this." The couple said apart from the bread biz being nourishing for both their bodies and souls, it's nourished their marriage. From sun-up to sun-down on their baking and selling days they are together. "We might not make a lot of money in the bakery, but we save a lot of money on marriage counseling," Schwartz joked.